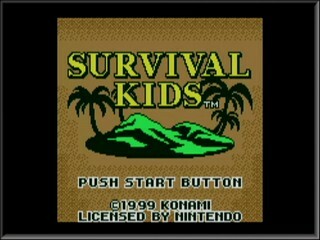 When Konami's Survival Kids (= Stranded Kids in the EU) hit shelves, it filled a strange little portable survivor game niche that captivated enough of an audience to spawn an entire series, later entries being renamed Lost in Blue. In this 1999 game adventurers are left to tend to their basic needs availing of natural ingredients found in the wilderness of a small island they've been cast away on. Later on, the story will present a different continuation of events depending on what the player has been up to. Now if you find where I turn too early and hit a wall, the reason is that it was too early. Typically any wall I want to enter using half my sprite. That causes my character to move at a slight diagonal instead of entering using my full sprite and moving at 90 degrees. You can see some of the forced diagonal movement at 1:54-1:56. 1:14 - Here I use a built-in save and restore to skip a cutscene here. Because of that, I can move about the island without losing any health stats (Hunger, Water, Fatigue) and time of day does not advance. 2:11 - Here I merged the Tree Bark and the Stick I recently picked up to get a Kindling. I do it here so that the same Stick I picked up will respawn since I used that item and pick it up again. I do need to sleep to get to the next day because to access the next area, I need to advance a day. 4:00 - Here I do the same skip as earlier but I'm skipping the event where I go to the adjacent area. This allows me to go out of bounds and access another event/warp to go to a different area. That warp is normally blocked until it is cut down. 5:47 - The radio call is RNG based. So luck has it that I get it in the first call. 6:06 - The scene where I create the SOS sign. The cutscene skip over that boulder where it allows me to access the beach. Thank you for watching my run of Survival Kids!